Potters fashion Matcha bowls from various clay in all of the famous pottery making areas of Japan. They are traditionally hand-built from local clay that has been fired in wood, electric or gas fired kilns that do not reach a high internal temperature. As such, Matcha bowls are softer in density and clay structure than porcelain tea wares, which are fired at a very high temperature and whose glaze has bonded with the clay to create a hard, durable piece. Matcha bowls are made for whisking and drinking powdered green tea and are durable for this use, but are not meant for drinking hotter-temperature types of tea such as black tea. Nor are they meant to be used as a teapot substitute for steeping loose-leaf tea. In Japan and Korea much attention is paid to the unique characteristics of handmade pottery, and this includes all of the variables that make a handmade piece unique. A drippy glaze, a slightly lopsided lip, a finger mark in the glaze, etc, are examples of character that shows ‘the hand’ of the maker. 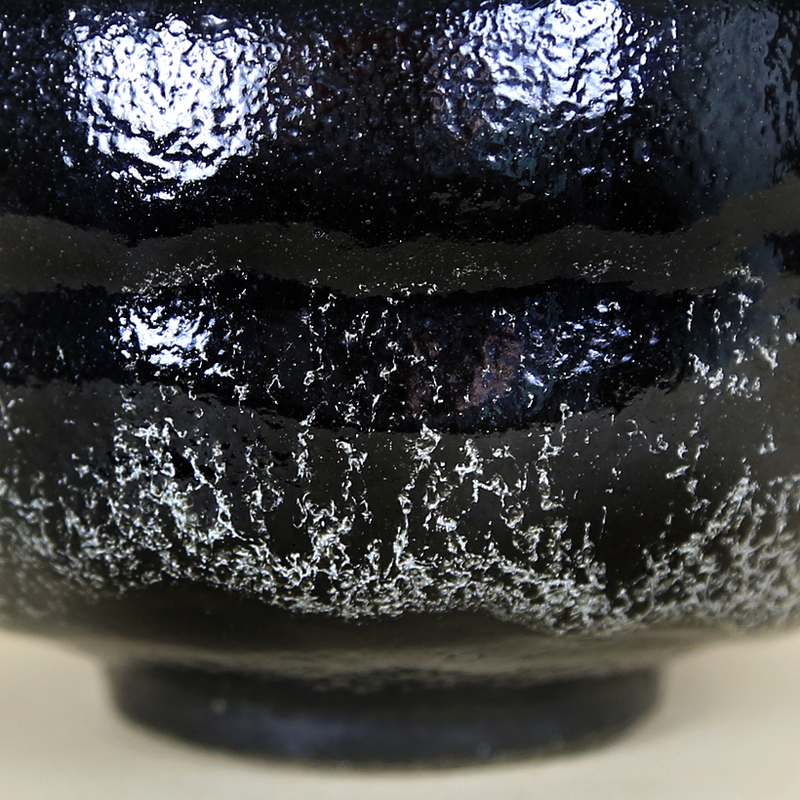 Matcha bowls can develop glaze cracks on the inside and outside surfaces of the clay depending on the type of clay and the type of glaze the bowl has been given. Cracks that appear only in the glaze with used (as opposed to cracks in the actual clay body) do not leak or weaken the vessel. Glaze cracks and are held in high regard by tea drinkers, tea wares collectors and potters. It is the ‘voice of the clay’ speaking, and is viewed as the piece contributing some ‘self-patterning’ to the surface appearance. No two pieces of pottery will ever be exactly the same when the glaze develops a unique pattern of distinguishing glaze cracks from use. Owning a Matcha bowl requires thoughtful handling and careful use. Matcha bowls are not intended for use in a microwave or dishwasher. These tea bowls are meant to be simply rinsed and air-dried on a kitchen towel on the counter-top after use. Using Matcha bowls for tea other than powdered green tea can result in introducing water to the bowl that is too hot – this will encourage more glaze cracking to develop. Please be aware that some foot-rings on Matcha bowls are intentionally not glazed and that un-glazed clay can be rough. While foot-rings such as these are considered desirable, one should take care to protect wooden table surfaces, counter-tops, and stainless-steel surfaces from being scratched. 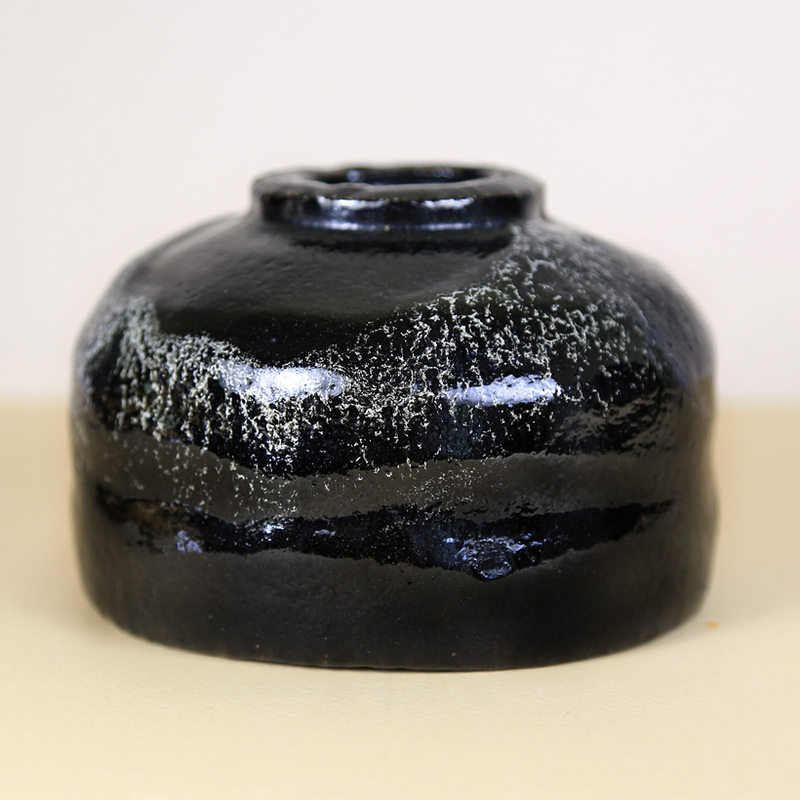 Authentic Raku ware is soft to the touch and warm in feeling. 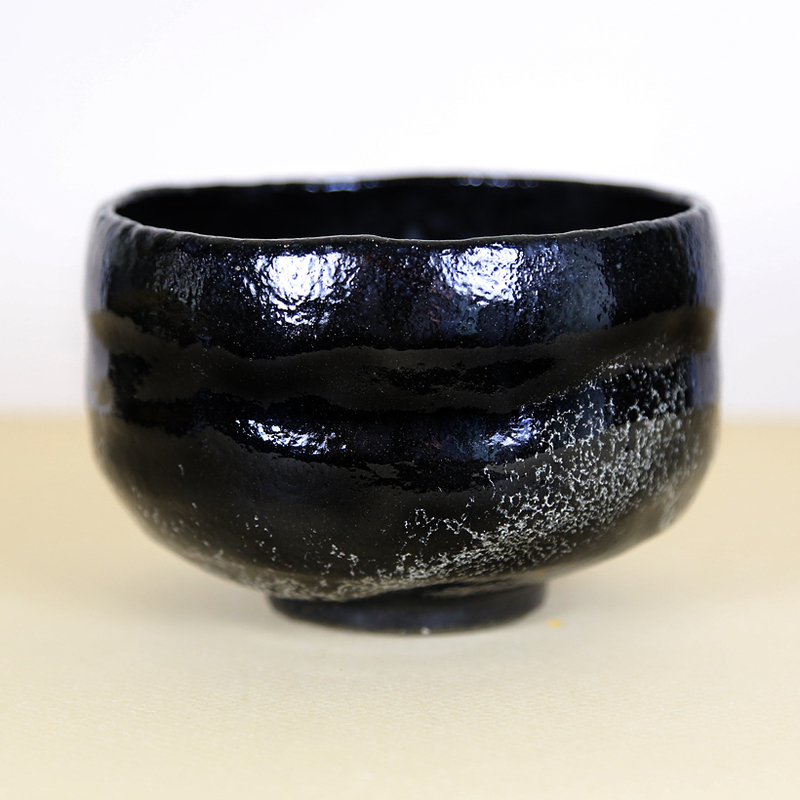 This is because it has been fired in a low temperature kiln and has been given several costs of thick glaze, making Raku very different from porcelain or eartherware matcha bowls. Raku ware will absorb a small amount of water and also absorb and retain a small amount of water within the clay after use. Upon first use of a new Raku tea bowl, it is recommended that you soak your Raku tea bowl in tepid water for 4-5 minutes to let the clay absorb a little water and become ‘accustomed’ to being used. It is also a good idea to soak a Raku bowl that is used every day for 1 minute in tepid water before each use. Please allow your Raku bowl to completely air-dry for a day or so after each use. If you are storing your bowl for long term in a box please allow the bowl to air dry for 5 days in a safe place before storing. Hand-made Japanese pottery utilizes traditional crafting skills and techniques. These pieces are not intended for use in the dishwasher or microwave, both of which can damage the tea bowl. Do not use dish soap or other type of cleaner on your Raku bowl. Raku pottery was the happy collaboration between the Japanese Tea Master Sen Rikyu (1522-1591) and the Korean potter Chojiro (1516-1592). 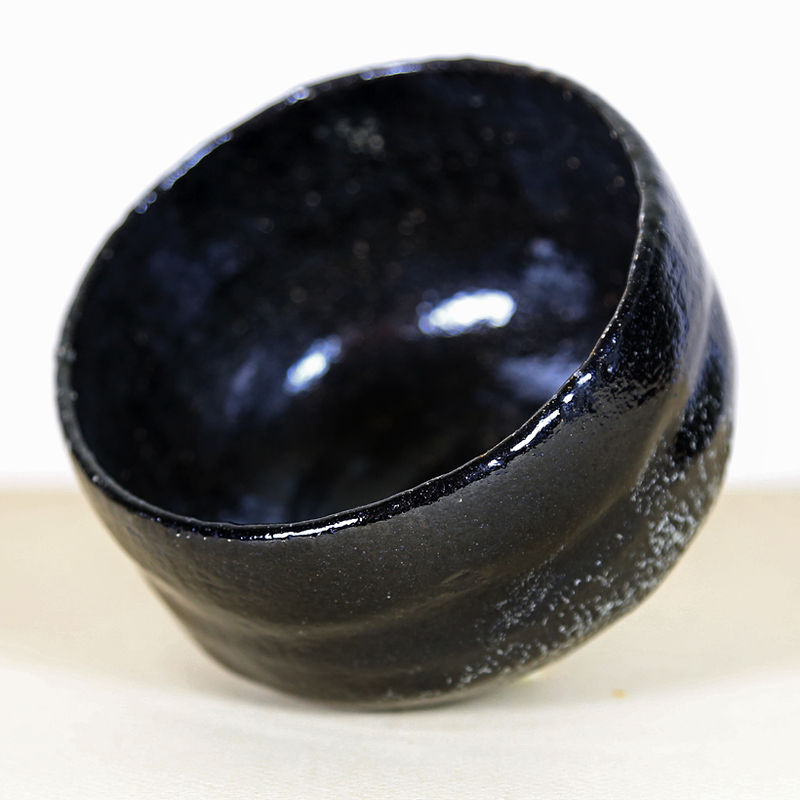 Chōjirō produced bowls at Sen Rikyu’s request that were made of soft pottery and featured un-embellished, rustic black or dark red /black glazes. These new bowls reflected Sen Rikyu’s wabi ideals of a tea bowl that was humble, simple and without decoration. This tea bowl aesthetic was just one of Sen Rikyu’s major contributions to the future direction of the practice of Chanoyu, the Japanese Tea Ceremony, and the design/ practicality of the tea utensils used in Chanoyu. According to the history of tea development in Japan, Raku pottery was the collaboration between the Japanese Tea Master Sen Rikyu (1522-1591) and the Korean potter Chojiro (1516-1592). 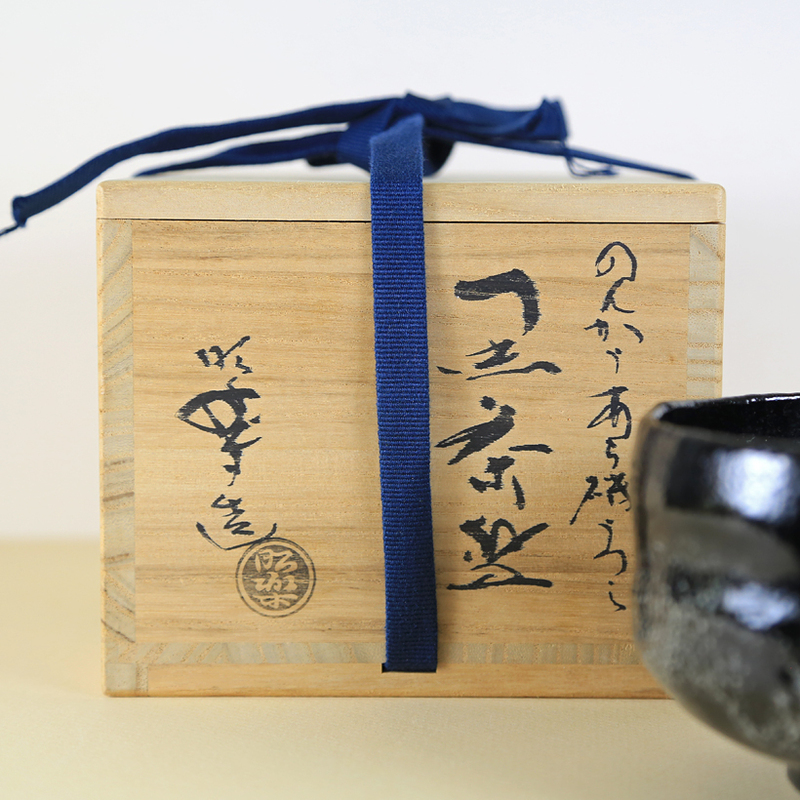 Chōjirō produced bowls for Chanoyu, the Japanese tea ceremony at Sen Rikyu’s request. These tea bowls were made of soft pottery and featured un-embellished, rustic black or dark red /black glazes. For his contributions, Chôjirô was given the family name Raku. His offspring continued the Raku family lineage, each of them becoming influential potters who contributed heavily to the stylistic development of tea bowls. Some of those early tea bowls can be seen in museums in Japan, Europe and the USA. All Raku family tea bowls are named, very famous and priceless, and are considered Cultural Assets or National Treasures in Japan. The Raku Museum in Kyoto, privately owned by the Raku family, treats visitors to a stunning display of historic tea bowls made by successive members of the Raku family, beginning with the first Raku, Chôjirô. Some of the bowls made by Chôjirô were commissioned by the famous Tea Master Rikyu for his use and that of his illustrious noble and wealthy students. 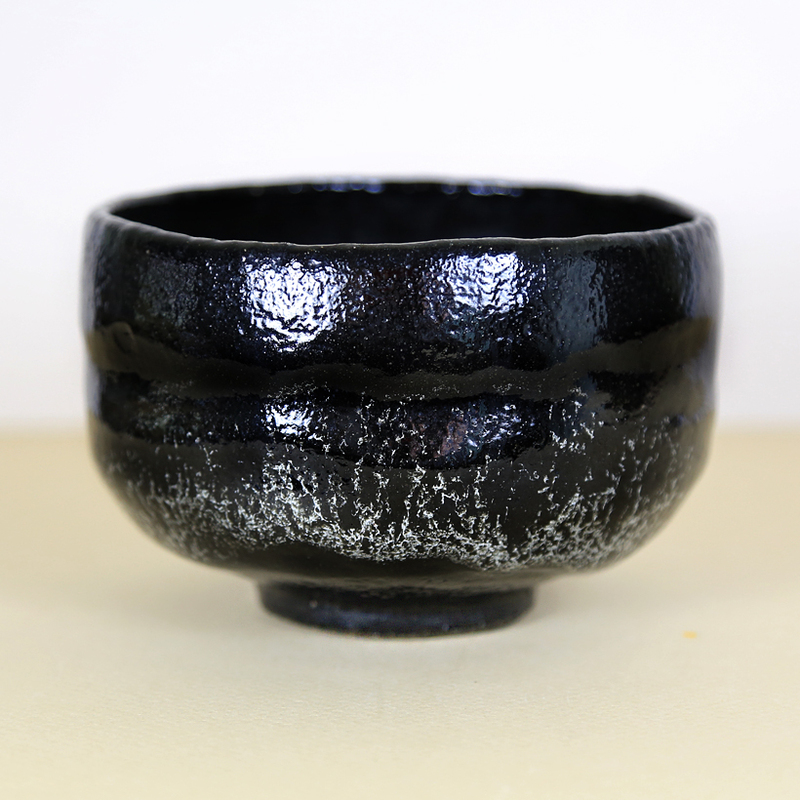 This raku tea bowl is a replica (utsushi) of one of Rikyu’s tea bowls that he named ‘Araiso’ or Craggy Coast. 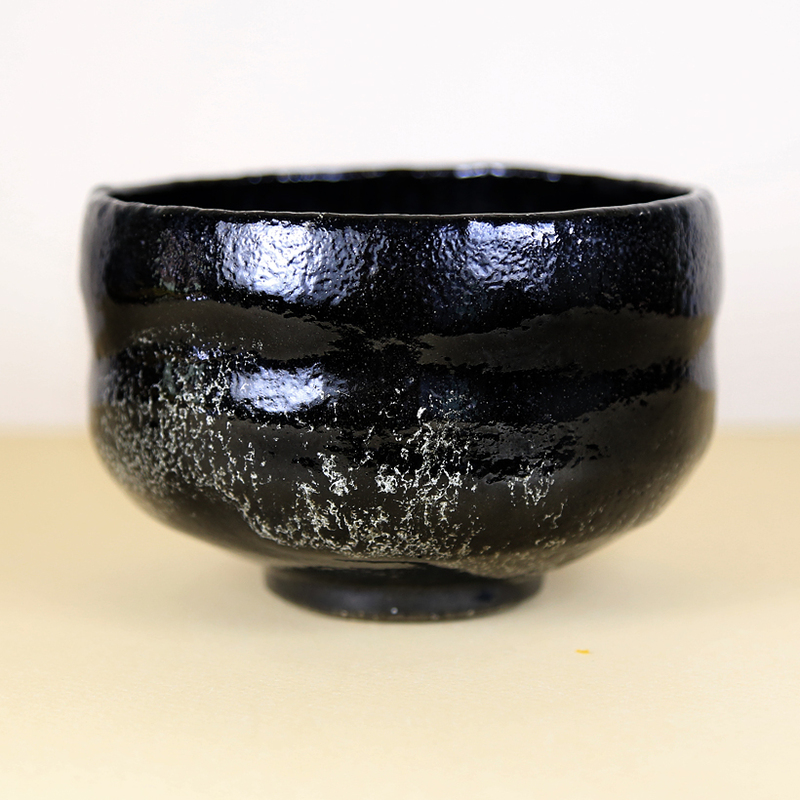 The original tea bowl was made by Donyu (1599-1656), the 4th Raku, It is generous in size and has the warm, soft feel and thick, shiny glaze unique to Raku ware. Gently, subtle undulations in the surface of the tea bowl provides some texture for the fingers to discover and appreciate. An expressive spray of whitish-grey glaze populates the lower half of the teabowl, perhaps suggesting sea spray on a blustery day. Otherwise, the overall feeling of the tea bowl is smooth and confident and spare of excessive decoration. The foot-ring elevates the bowl so that one may appreciate the dappled glaze work at the bottom of the tea bowl. The rim of the bowl curves inward ever so slightly. This is a handmade item – slight variations in the painting, colors, tooling, patterning and kiln effects of Chinese and Japanese teawares are to be expected. We have carefully photographed this item as best as possible – please be aware that different device screens can render colors and subtle tones slightly differently.